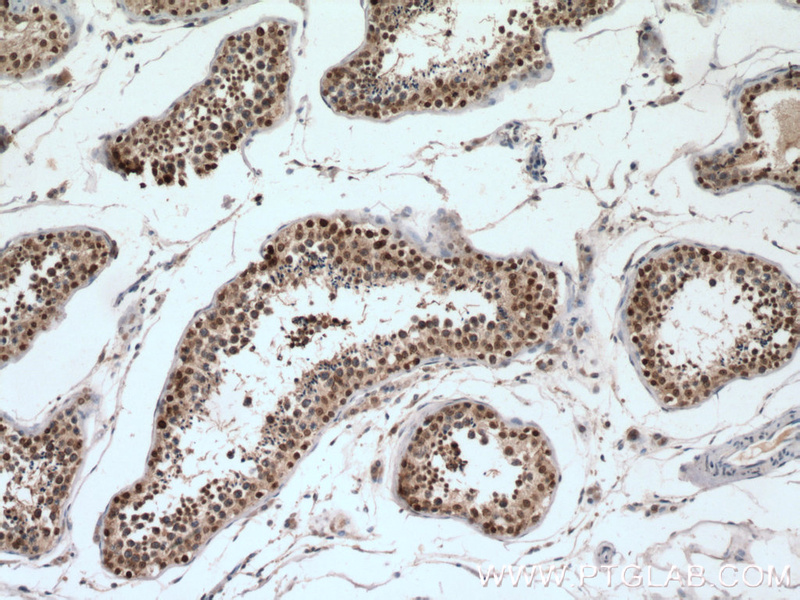 Immunohistochemistry of paraffin-embedded human testis tissue slide using 10329-1-AP (SUMO1 antibody) at dilution of 1:200 (under 10x lens) heat mediated antigen retrieved with Tris-EDTA buffer(pH9). 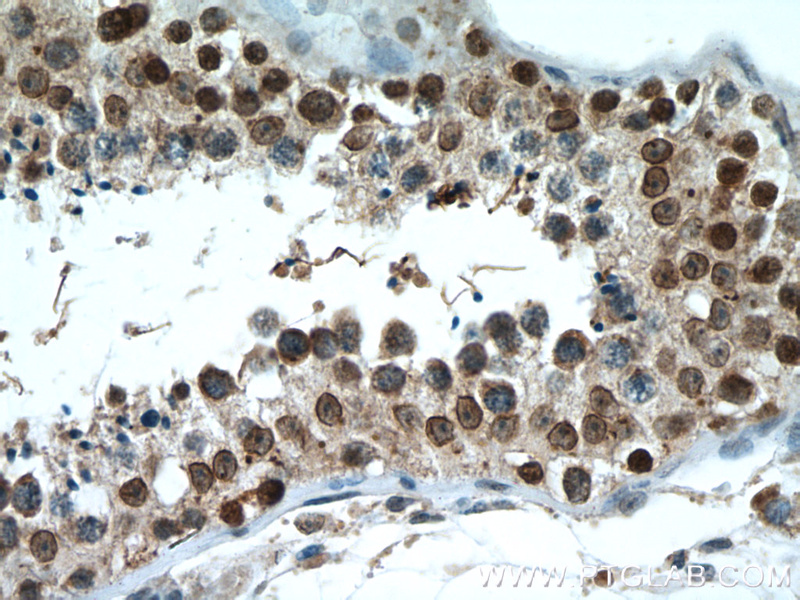 Immunohistochemistry of paraffin-embedded human testis tissue slide using 10329-1-AP (SUMO1 antibody) at dilution of 1:200 (under 40x lens) heat mediated antigen retrieved with Tris-EDTA buffer(pH9). Ubiquitin is most famous for its function in targeting proteins for degradation by the 26S proteasome, ubiquitin needs to be attached to a substrate in chains (polyubiquitylation) before being recognized by proteasome. Similarly, SUMO (small ubiquitin-related modifier) can be linked to substrates in chains (polysumoylation), SUMO modification has been implicated in many important cellular processes including the control of genome stability, signal transduction, targeting to and formation of nuclear compartments, cell cycle and meiosis. There are 4 confirmed SUMO isoforms in human, SUMO-1, SUMO-2, SUMO-3 and SUMO-4. SUMO-2 and SUMO-3 are nearly identical but are distinct from SUMO-1. SUMO2/3 conjugation was recently widely involved in neuroprotective activities. A substitution (M55V) of SUMO4 was strongly associated with the pathogenesis of type 1 diabetes (T1D) involving NF kappa B related mechanisms.This antibody can detect endogenous levels of SUMOylated proteins (e.g. SUMO-1-RanGAP at 80-90 kD). SUMO2 modification of Aurora B and its impact on follicular development and atresia in the mouse ovary. SUMO-1 modification of FEN1 facilitates its interaction with Rad9-Rad1-Hus1 to counteract DNA replication stress.